The gorgeous-sounding, tube-powered T-Rex Room-Mate has been a huge success – with guitarists around the world using it to bring their sound to life. Now, we’re proud to present the next generation of our Room-Mate reverb. It offers the same rich, tubey warmth you know from the first Room-Mate, but we’ve enhanced it based on your feedback. 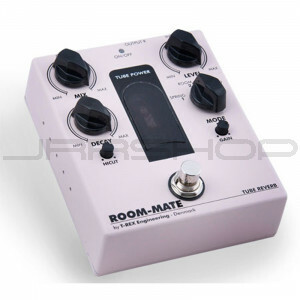 The new Room-Mate offers the same phenomenal-sounding Room , Hall and LFO modes you already know. But we’ve added a completely revamped Spring mode that will simply blow your mind. When the decay is set low in Spring mode, Room-Mate emulates a short-spring reverb. Turn the decay up, and you get a killer long-spring reverb you just won’t hear anywhere else. and makes the pedal distort. Pedal gives stereo output through the left and right output jack plugs.